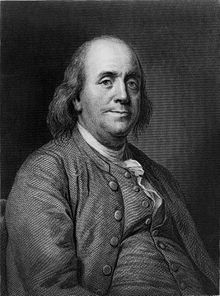 Franklin punned that compared to his ruminations on flatulence, other scientific investigations were "scarcely worth a FART-HING". "Fart Proudly" (also called "A Letter to a Royal Academy about farting", and "To the Royal Academy of Farting") is the popular name of an essay about flatulence written by Benjamin Franklin c. 1781 while he was living abroad as United States Ambassador to France. "A Letter to a Royal Academy" was composed in response to a call for scientific papers from the Royal Academy of Brussels. Franklin believed that the various academic societies in Europe were increasingly pretentious and concerned with the impractical. Revealing his "bawdy, scurrilous side," Franklin responded with an essay suggesting that research and practical reasoning be undertaken into methods of improving the odor of human flatulence. I have perused your late mathematical Prize Question, proposed in lieu of one in Natural Philosophy, for the ensuing year...Permit me then humbly to propose one of that sort for your consideration, and through you, if you approve it, for the serious Enquiry of learned Physicians, Chemists, &c. of this enlightened Age. It is universally well known, that in digesting our common food, there is created or produced in the bowels of human creatures, a great quantity of wind. That the permitting this air to escape and mix with the atmosphere, is usually offensive to the company, from the fetid smell that accompanies it. That all well-bred people therefore, to avoid giving such offence, forcibly restrain the efforts of nature to discharge that wind. The essay goes on to discuss the way different foods affect the odor of flatulence and to propose scientific testing of farting. Franklin also suggests that scientists work to develop a drug, "wholesome and not disagreeable", which can be mixed with "common Food or Sauces" with the effect of rendering flatulence "not only inoffensive, but agreeable as Perfumes". The essay ends with a pun saying that compared to the practical applications of this discussion, other sciences are "scarcely worth a FART-HING." Copies of the essay were privately printed by Franklin at his printing press in Passy. Franklin distributed the essay to friends, including Joseph Priestley (a chemist famous for his work on gases). After Franklin's death, the essay was long excluded from published collections of Franklin's writing, but it is available online. ^ a b c d Japiske, Carl, ed. (2003). Fart Proudly: Writings of Benjamin Franklin You Never Read in School. Berkeley, CA: Frog Books. ISBN 9781583940792. ^ a b Franklin, Benjamin (1781). "The Royal Academy of Farting *****". teachingamericanhistory.org. Retrieved 2016-09-26. This page was last edited on 13 April 2019, at 04:21 (UTC).